Do you know someone who spends far too much time Blogging? Do they only want to hang out with other bloggers? Are they prone to silent introspection in person, but then share way too much information online? Do they rate life experiences on a scale of "blog-worthiness"? If you answered yes to any of these questions, your friend may have a clinical addiction to blogging. 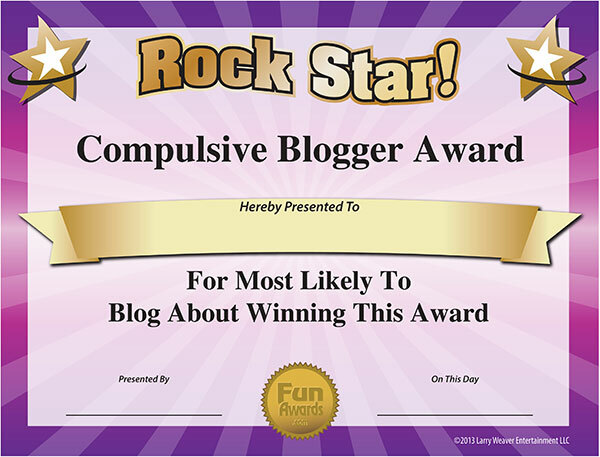 Show them you acknowledge their posting obsession with this free funny award. Download the certificate, type in their name, and post it on their office door or cubicle. 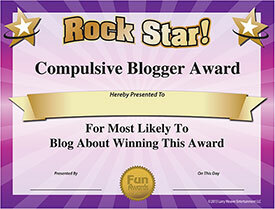 Then rush back to your computer to see if they blog about winning this award. Download 101 Funny Employee Awards Certificates! If you like this free funny award, be sure to pick up our 101 funny award certificates eBook. These awards are perfect for every worker at any type of business.